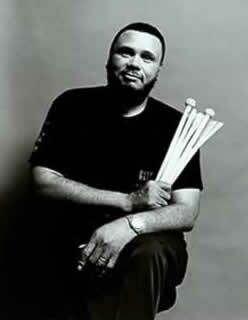 Drummer Keith Copeland, son of trumpeter Ray Copeland, is fromNew York City, where he was born on April 18, 1946. He begantaking drum lessons at the age of ten and acquired his union cardfive years later. In 1967, after a four-year spell in the US Air Force,Copeland began studying drums at Berklee College in Boston and then, in 1975, began a three-year spell teaching at the College. Since then he has won an impressive international reputation as a drummer, composer, arranger and clinician. His musical associates over the past 20 years have included GeorgeRussell, Johnny Griffin, the Heath Brothers, Hank Jones, Milt Jackson,Stan Getz, Phil Woods, Stéphane Grappelli, Slide Hampton, KennyBarron and Roger Kellaway. In 1992 Copeland was appointed professor of jazz percussion at the Hochschule für Musik in Cologne.